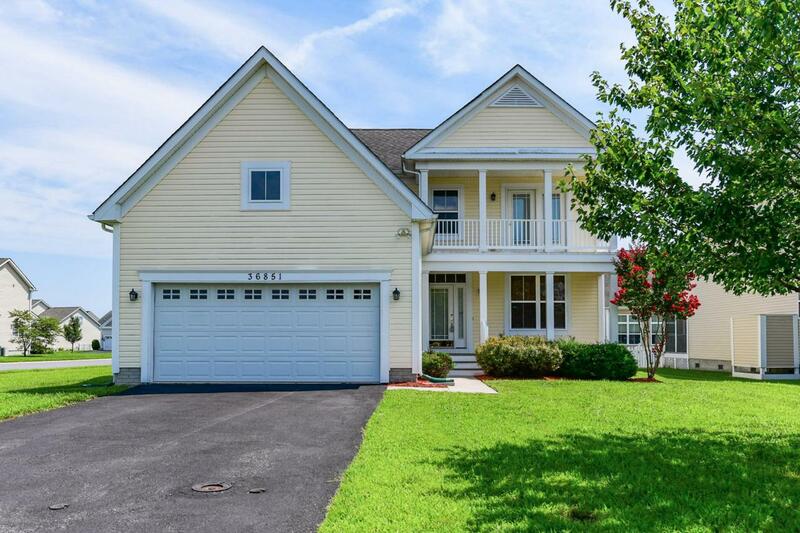 Enjoy elegant Delaware coastal living close to the beach resorts in this large 4 bedroom ~Sea Spray~ floor plan with over 100k in original builder upgrades. The exterior of this home which sits on an oversized corner lot features low maintenance decking, a welcoming 2-level front porch, a 2-car garage, and a 23~ screened porch on the rear of the home. The screened porch offers access from the sun room as well as a separate entrance from the master bedroom. Interior upgrades include ceramic tile, crown moulding throughout the home, and a built-in electric fireplace. This home is light and bright with vaulted ceiling in the living room, sky lights in the sun room, and upgraded light fixtures throughout. The kitchen will delight with stainless steel appliances, granite, and exquisite cherry finish cabinetry with wine storage and accent glass doors. Enjoy entertaining with a breakfast bar and open concept living areas. Large pantry offers upgraded storage with ample shelving. You will appreciate the attention to detail with custom trim at the dining room entrance. The deluxe laundry room offers ample work space and storage with white cabinets and large counter space with inset stainless steel sink. Relax in the master bedroom suite with large walk-in closet, master bath with upgraded flooring and shower tiles, jetted corner tub, and separate his and hers vanity cabinets. This immaculate home only needs your furnishings and decor to make it your perfect home! Swann Cove amenities include community clubhouse, outdoor pool, fitness room, walking paths, picnic area, playground, kayak launch, pier, and more. Excellent location just across the street from the community clubhouse & pool.